You can now use the Mattermark API to track the historical data of 1+ million private companies and predict the world’s next market leaders. We are at the beginning of a data revolution, and the way businesses make sales and investment decisions are set to fundamentally change. At Mattermark, we’ve organized a massive amount of data on the world’s fastest growing private companies. Starting today, companies can tap into our data to build proprietary solutions that predict tomorrow’s fastest growing businesses. Find companies that will become your largest customers and make better investments with our API. A growing number of companies – many supported by technical teams – use proprietary data to be more effective. Cutting edge venture funds make smarter investments through data science. Innovative SaaS companies use data to target high-potential prospective clients when they are still small. They, and others like them, are injecting predictive data into formerly data-poor processes to realize outsized returns. These companies have a considerable edge. As all companies get smarter around using data to guide decisions, it will be critical that you do the same. There is a lot of data surfaced in the Mattermark web and mobile clients – but we have a whole lot more in our database. Going back to 2013, we have month-by-month data points for things like: The Mindshare Score, Growth Score, employee growth, web traffic, and twitter mentions for millions of companies. Our API can help you develop proprietary insights that no one else will have. It will help you pick winners – the companies you want to invest in or sell to. 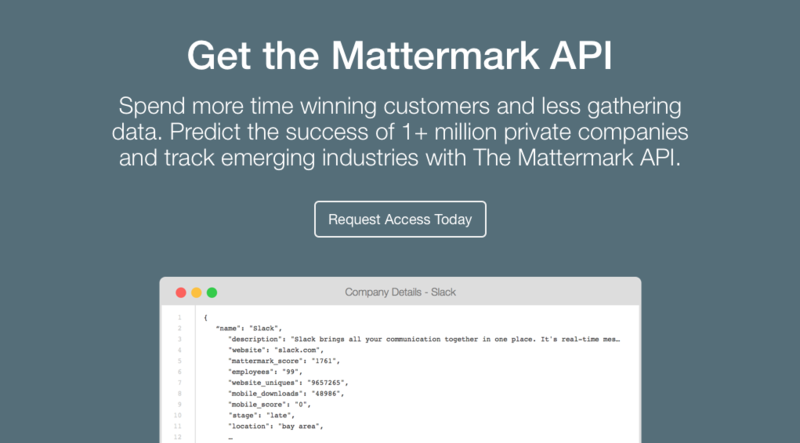 The Mattermark API is available immediately, and we’re happy to walk you through the simple integration. We can’t wait to hear about the opportunities you uncover. Get in touch with our team today to get started!